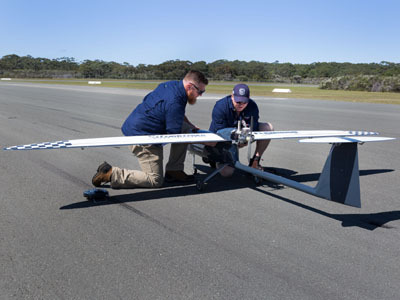 Pre-flight checks on Silvertone UAV's Flamingo Mk3 at the Jervis Bay Airfield. Autonomous Warrior 2018 combines scientific trials, industry demonstrations and the exercising of in-service robotic and autonomous systems in what is the largest activity of its kind ever conducted by western allies. Minister for Defence, the Hon Christopher Pyne MP, said the Autonomous Warrior event positions Australia at the forefront of emerging technologies. "Autonomous systems will continue to increase in prevalence for military applications and Australia is a leader in developing unmanned systems," Minister Pyne said. "Industry, defence science organisations and militaries from five countries are examining air, land, sea and cyber systems and their potential for use in complex and contested environments. "The trials and demonstrations will provide Defence a clearer picture of the future of robotic and autonomous systems and how we might use them to remove people from harm's way, or multiply our effectiveness, with intelligent systems." Autonomous Warrior will bring together the latest technology and brightest minds to further develop understanding and expertise in unmanned capabilities. "Building on the success of Unmanned Warrior 2016 in the United Kingdom, we have up to 500 people from more than 40 companies showcasing their latest capabilities and demonstrating their application through real-world scenarios," Minister Pyne said. "Activities across air, land and sea domains will explore our ability to control multiple unmanned and autonomous systems concurrently to deliver a warfighting effect. "Autonomous systems will be fully integrated in our future fleet and Autonomous Warrior 2018 is an opportunity to inform our future projects that will deliver an enduring capability."